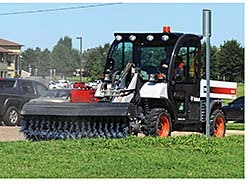 The Tier 4-compliant 5600 and 5610 Toolcat™ utility work machines incorporate a non-diesel particulate filter engine solution. These machines also feature a traction-control system designed to provide operators with better mobility when ground conditions are conducive to traction loss or the machines' wheels encounter obstructions, such as rocks or debris. A new illuminated rocker switch located on the dash of the 5600 and 5610 allows operators to turn the traction control system on or off as needed.